NB The standard changeover day at Grove Cottage is a Friday. We do allow short breaks at all but the busiest times - just ask. Please be aware that for short breaks and non standard start days, the pro rata price displayed on this website will not be correct. Please just contact us for pricing. 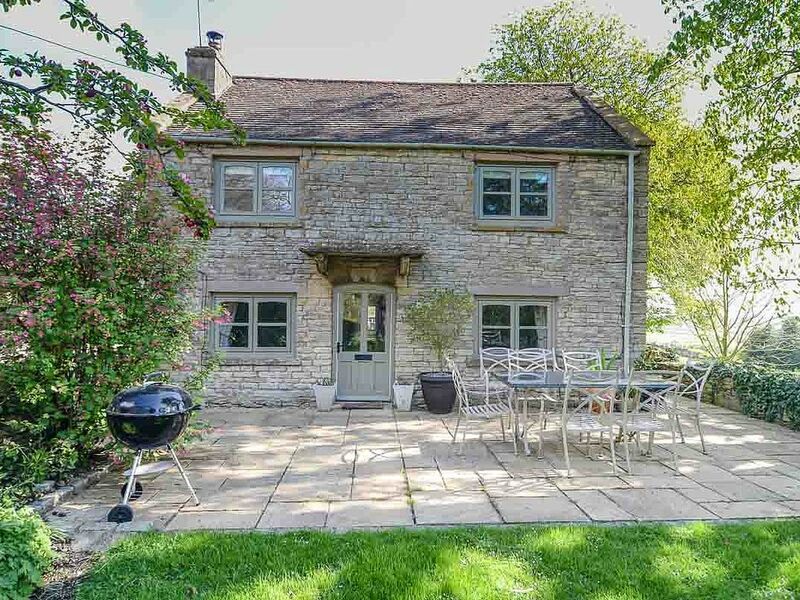 Grove Cottage is a traditional Cotswold cottage right in the heart of this great area. It has 4 bedrooms and 3 bathrooms and has been refurbished at the end of 2012 as a comfortable and modern family home. Finishes are of a high quality, with plenty of understated and muted tones, perfect for cosy evenings in, after a day's shopping or sightseeing, glorious walks, or a day at Cheltenham races. There are 2 terraces, facing East and South-West, for relaxing in warm weather, children's wooden swings, and a tree-house at the end of the garden. Hazleton itself is a small hill village, which benefits from being a 'no-through' village, with very little traffic around the village and virtually none passing the house. Join the local dogs out around the lanes! Or set off on any of the footpaths that criss-cross this fantastic and beautiful area. Or if towns are more your thing - take your pick of the Cotswolds' finest all within a short drive. The family bathroom is at the top of the stairs, and consists of a bath, loo and basin. The master bedroom has a modern and smart ensuite, while the 2nd bedroom also has a new shower, loo and basin. Parking is opposite the cottage (across a very quiet lane) on a dedicated and private gravel area that can fit 3-4 cars easily. The sitting room looks out West over the main garden, and is laid out comfortably for relaxation. There are 2 sofas - one large for 3 and one smaller - as well as 2 arm chairs. The TV is a 40 inch Samsung, while a wood burner keeps every cosy and warm. French windows out to the terrace dominate the kitchen. An electric range provides plenty of options, with the room completed with beech worktop, double Belfast sinks, Bosch dishwasher, breakfast table and a comfortable window seat with great views! Large dining room table - seating 8-10 comfortably, and with extra leaves if more space is needed. Notes on accommodation: We welcome well behaved dog(s). Outside: Grove Cottage has two garden areas with plenty of room for games and relaxation. There are also 2 terraced areas - one accessed from the kitchen French windows has wonderful views down the valley; while at the other end of the house, the 2nd terrace overlooks the main garden. At the end of the garden there is a small treehouse and wooden swings across the quiet lane in the 2nd garden area - fun for the children. There is a marble table and wrought iron chairs for eating out. But the whole surrounding countryside is really yours to enjoy - with walks and trails in every direction. Utility Room: The utility room has a chest freezer (complimenting the 2 under counter fridges in the kitchen), and a Bosch washing machine and an AEG tumble-dryer. There is also a sink and worktop. Cleaning / Towels / Linen / Maid service: Lovely 100% cotton white linen is provided throughout the house. You can also enjoy thick white luxury bath and hand towels. The house should be found spotless and a standard clean is provided included in your rent. Other: The Dining Room fills the centre of the house, with views across to the Church. The dining table seats 8 comfortably. The room provides a great space for entertainment and fun at any time of the day. There is also a breakfast table in the kitchen. Lovely cottage in beautiful countryside. It was a lovely cottage for our 6 people and one dog. Well equipped, warm and comfortable. Some decoration was "tired" eg. catch missing on twin bedroom door frame, but it all worked well. A standup shower for the bathroom would be welcome. The location and general appearance of the cottage was lovely and the surrounding countryside beautiful. We enjoyed the walks direct from the cottage, particularly to The Plough pub, in Notgrove. Overall, a delightful stay. Lovely cottage, great views. Cleanliness not perfect and furnishings shabby in places but did not spoil our weekend. Issue with heating quickly resolved by owner. Kitchen very well stocked, we all loved the dining room. Would definitely recommend a stay here. Great House & location, just as described. perfect for touring the countryside. You would definitely need a car. We met up with old friends so wanted a comfortable place to sit & chat and to play cards and do puzzles, and remissness in the evening. Games were provided. Very clean and well equipped house. Plenty of space for two Labradors and good walks too. One thing though, if you are staying for more than a few days, there is not much hanging space in the other 3 bedrooms and they also need a mirror (Master is fine). All in all we would recommend to friends. The whole area is very popular among walkers - with many arriving for the week or just for a day to enjoy the fantastic surroundings. Northleach, a small town, is just a few miles away - while the larger towns of interest such as Bourton-on-the-Water, Stow-On-the-Wold and Burford are all within 15 or 20 minutes drive. The large centres of Cheltenham and Cirencester are also within 20 minutes drive. Changeover Day: The standard changeover day is Friday with arrival at 4.00pm and departure at 10.00am, but at Easter, Half-Terms and Christmas/New year we can be flexible, so do enquire. We welcome short breaks as well - so ask!